紅龜粿 Ang Ku Kueh is a much-loved steamed “kueh” whose influences stretch across several communities as a shared heritage. It originated from the south-eastern coastal province of Fujian, China. Typically associated with the Hokkien-speaking communities in Fujian as well as across the Straits in Taiwan, the Hakka community too have their own version which they call 龜粄 or 新丁粄. They are also very popular amongst the Chinese communities in Singapore, Malaysia, Indonesia, Thailand and other parts of the world. For the Chinese, the tortoise is symbolic of longevity, to be blessed with a good and long life. The notion of “富贵长命” is a hope for many which translates into good wishes for our loved ones, especially to the “orang tua” i.e. elderly and is echoed within Peranakan culture to be “ho miah” and be blessed with a “panjang panjang umor“. 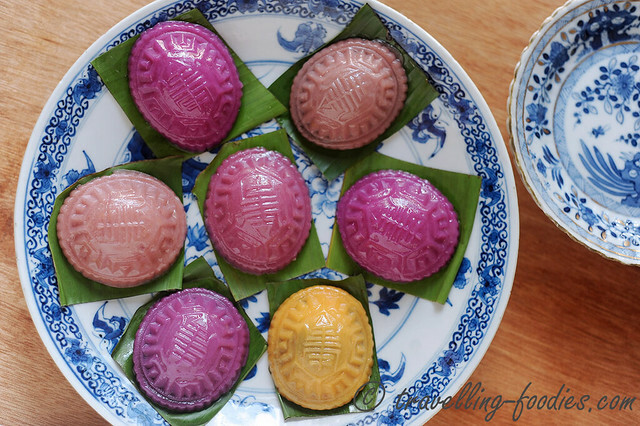 Prosperity, longevity, good fortune…there is an old Hokkien nursery rhyme with several variations to the phrases that depicts how the angku kueh can make all these come true and here is one variation of it. 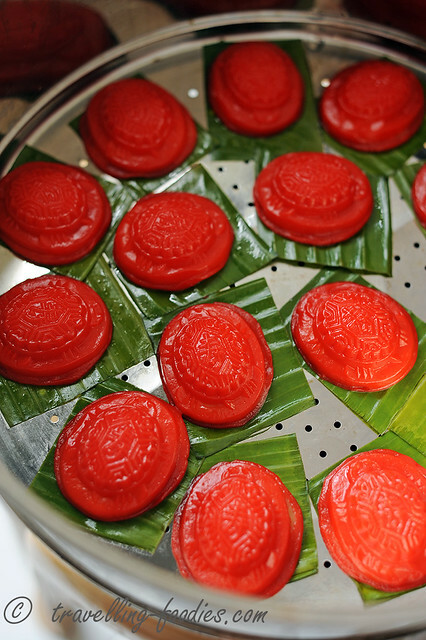 As such, the traditional angku kueh in its customary festive red would make its much anticipated appearance in many important celebratory and ritualistic events, like the first month celebrations of a newborns, prayers on the birthdays of deities with that of the Jade Emperor’s on the night of the 8th day of the Lunar New Year being the most important of all. 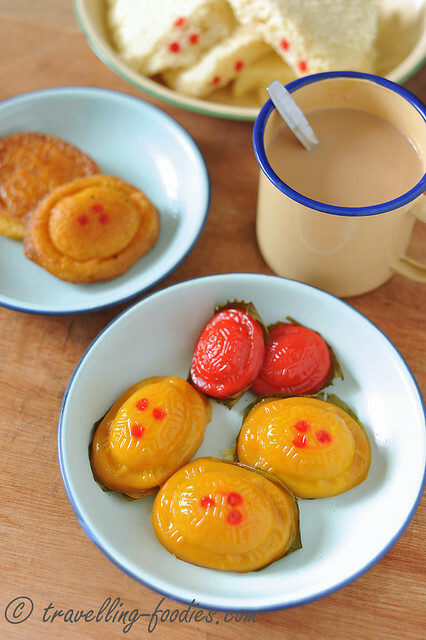 With so many “benefits” one can reap from just touching and eating these steamed glutinous rice red tortoise cakes, better be fast to make some now! Back in China and Taiwan, their angku kueh are basically filled with peanut or red bean paste. Here back at home in Singapore and Malaysia, angku kueh are usually filled with mung bean paste though recently improvisations also include grated coconut cooked in gula melaka, not to mention and assortment of flavours for the mung bean paste now from matcha to durian. The mung bean paste is essentially skinned and split green beans which have been soaked for an hour or two, then steamed until soft, mashed, added with sugar and salt befoe being finally fried until aromatic. This is the tedious part in making angku kueh. I’d used my trusty Thermomix for the job of blending the hot mung beans fresh from the steamer. Sugar and salt are added at this stage with a bit of water added to ease the blending. Basically any decent food blender would do the job. 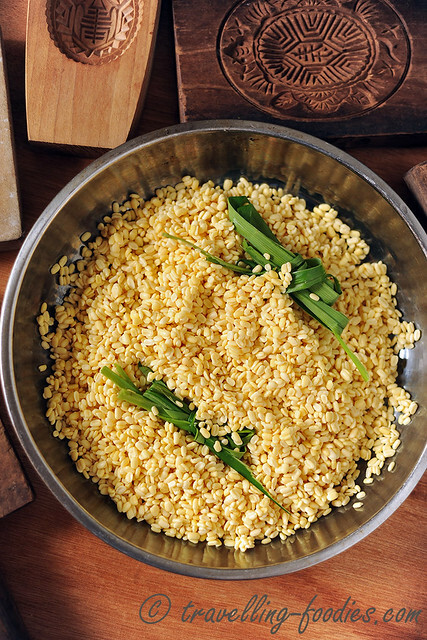 The blended mung bean paste is then slowly fried in shallot oil until aromatic traditionally but we use good peanut oil at home to serve the same purpose. While waiting for the filling to cool down, I made the wrapping skin for the filling. Traditionally, glutinous rice grains which had been pre-soaked for a couple of hours will be ground down into a thick paste before being poured into a muslin bag and weighed down with a batu giling to press out the excess water overnight. Part of the compressed crumbly “cake” of ground glutinous rice is then reconstituted with some water and cooked into a very thick glue-like paste resembling very very soft muah chee to form the “ibu” to be added to the rest of the ground glutinous rice and kneaded to form an elastic dough. From what I know, very very few people still maintain this tradition of making the skin from scratch with glutinous rice grains in Singapore. Most no longer grind their own glutinous rice paste but instead adopted the use of packaged glutinous rice flour instead which is much easier and approachable. Instead of making an “ibu” by cooking part of the glutinous rice flour with water, sweet potato can also be added for the same purpose. 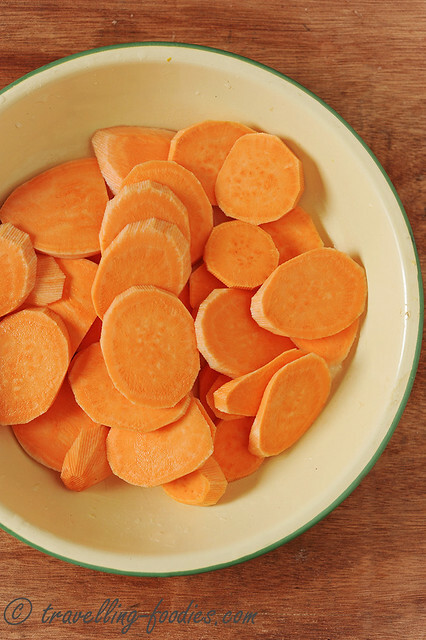 The sweet potato is first peeled, sliced thinly and steamed until soft. 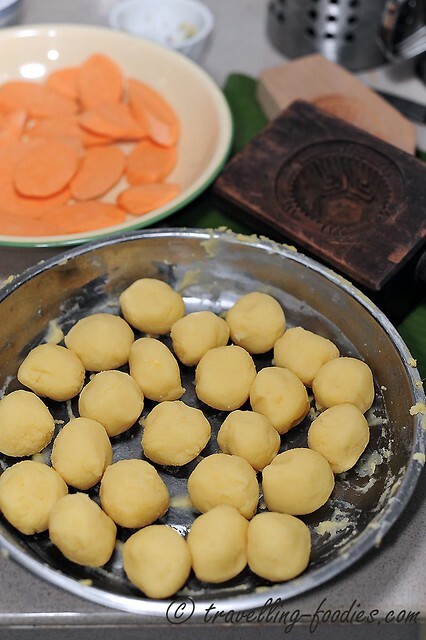 While the sweet potato slices are still hot, they are mashed with a fork and then added into glutinous rice flour. This is a common practice for folks making angku kueh here in Singapore and Malaysia. 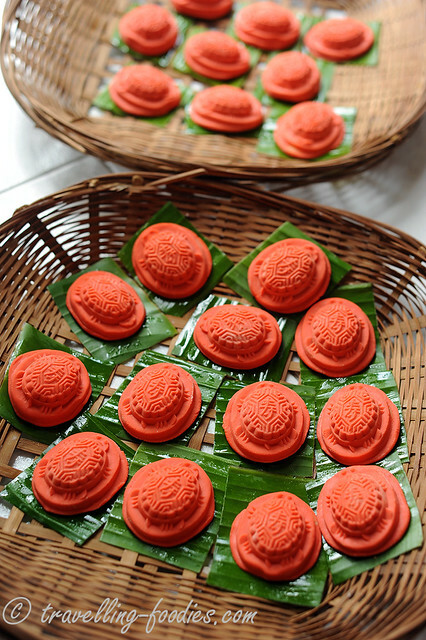 Water is then added to soften the dough and make it pliable and elastic, while for the Peranakans’ version of kueh koo merah, fresh coconut milk is added in place of water. While the mung bean filling has cooled down sufficiently, they can be rolled into balls. The ratio of the mung bean filling to the skin is approximately 1:1. There is a simple method to know the capacity of one’s mould. 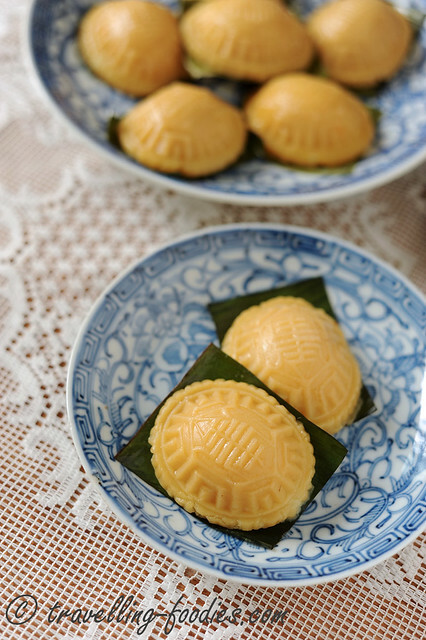 First, take the angku kueh mould and pack it with enough dough which was processed from sweet potato and glutinous rice flour for the skin until it just nicely fits into the cavity. Carefully remove the lump of dough used, weigh it with a kitchen scale and divide the reading by two. For example, if the mass of dough that is needed to pack the cavity of the mould nicely weighed out to be 60g, then final ratio should be 30g mung bean filling to 30g dough. This ratio produces fairly “thin-skinned” angku kuehs which are perfect for me. If you should desire, tilt the ratio slightly for more filling, i.e. 33g filling with 27g dough skin but risk the uber thin skin breaking during handling or steaming. Here comes the fun part. 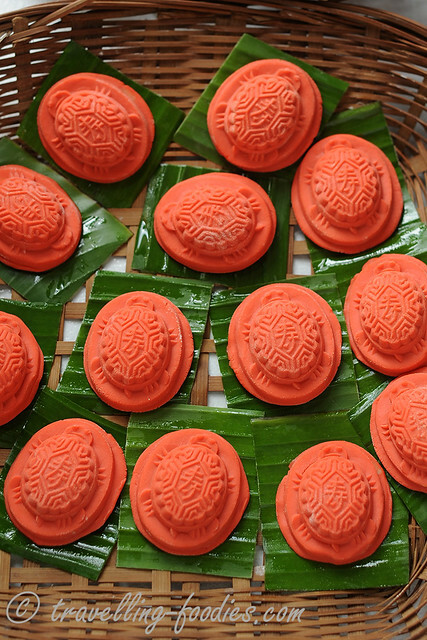 Traditionally angku kueh is coloured by adding a powdered cochineal red dye into the dough. But if one was to leave them in their “bare colours”, they will gladly take on the beautiful shades of the different types of sweet potatoes that were used in their making. These above are made with our local orange sweet potatoe varieties and left “uncoloured” and thus looked golden yellow. If the Japanese purple varieties of sweet potatoes are used, they would take on beautiful purplish shades. The intensity of the purple can be played around with by mixing doughs made from different sweet potato varieties and by changing the ratios and proportions. And this is what those look like after they are steamed…. not very traditional yes but absolutely gorgeous ain’t they? 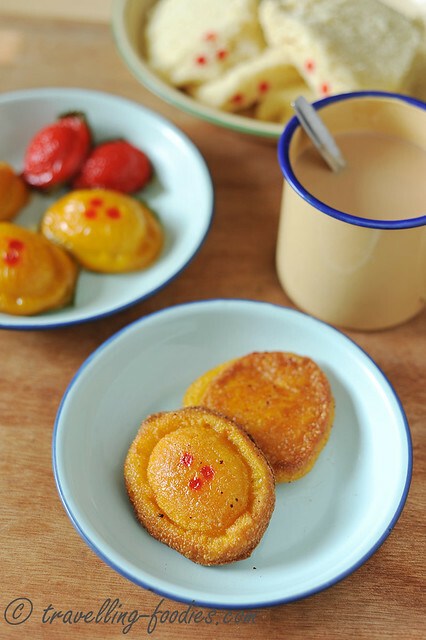 One can also use steamed pumpkin in place of sweet potatoes, pandan juice, carrot juice and bunga telang juice instead of the regular water or coconut milk, to get the kueh koos in a riot of colours! Al naturale yes but to the purists, the red angku kuehs are probably the only ones they will approve of when it comes to prayers and important ritualistic events. But I guess its really up to one’s personal imagination if they are made solely made for own consumption or to share with loved ones. I’d made some fashioned out of one of the sides of my old mould which takes the shape of coins as well this year but admittedly they are not really well made. Nevermind, I will try again when I make the next batch of angku kueh and I’m sure with practice they will turn out just fine! And this is what the angku kuehs would look like when they are freshly out from the steamer. Given that the filling is already cooked and the skin is so thin, angku kuehs do not take a long time to steam at all. The old practice is 3 minutes under high heat covered and then another 2 to 3 more minutes with the cover slightly open to let the excess steam escape. 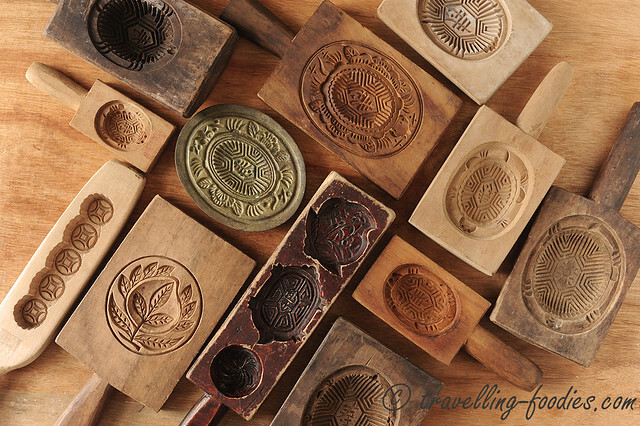 The latter is important to get really defined imprints on your angku kueh. Should they be steamed for too long, the skin would expand too much thus marring the imprints. It is of course very important to brush the freshly steamed angku kueh with a thin layer of oil. This helps to prevent the skin from drying out too fast, allowing them to stay soft and moist for a longer period of time. One of the old ways which I was taught to make the kueh koo which are not red “usable” for prayers is simply to dot the surface of the skin with red food colouring once they are out from the steamer. This “transforms” them into kueh koos which are no different from those fully red-dyed ones. Symbolically so at least. So for those who do not wish to put too much red colouring into your food yet wishing to retain the festive red on your kuehs, this might be a viable option for you. Apart from enjoying the angku kuehs when they are freshly out from the steamer, another ingenious way of eating the angku kuehs which may have been slightly past their prime would be to pan fry them lightly with a bit of peanut oil until the skin is uber crisp. This is my favorite way of eating angku kueh and if you have not eaten angku kueh this way before, I strongly urge you to try it and I assure you will not regret! Strain the soaked mung beans to remove excess water and spread them over a shallow dish or tray. Steam at high heat until the mung beans are really soft. 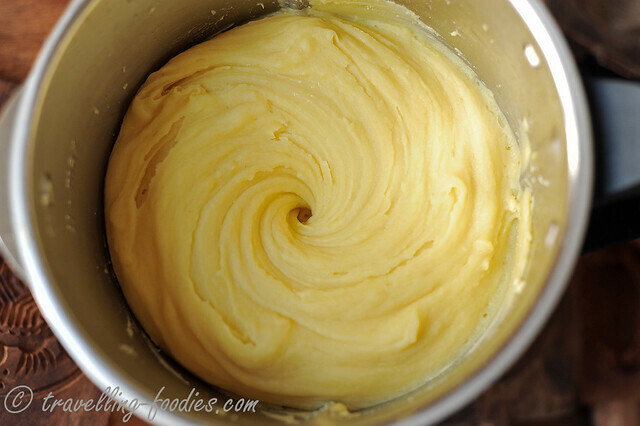 Place the steamed mung beans, sugar, salt into a food blender and blitz until everything forms a smooth paste. Add a few tbsp of water to help with the blending if necessary. Add peanut oil into a heated wok over medium heat and pour the mung bean paste into it. Fry the mung bean paste until it is aromatic, dries up slightly and no longer sticks to the side of the wok. Spread the fried mung bean paste over the shallow tray again and leave to cool down completely before rolling them into portions of 30g balls. While waiting for the filling to cool down, prepare the skin. Place sweet potato pulp, peanut oil, coconut milk, salt and sugar in a food blender and blitz until it forms a thick slurry. Place half of the glutinous rice flour into a mixing bowl and pour the wet ingredients slurry over it. Knead the mixture with clean hands and slowly add more flour in the progress 1-2 tbsp each time until the dough no longer sticks to the hands or sides of the bowl and achieves a texture similar to that of our earlobes. That was the “test for texture” my grandma taught me. Not very scientific I know but it works all the time. Add food colouring into the dough and proceed to fold and knead until the dough becomes homogeneously coloured. 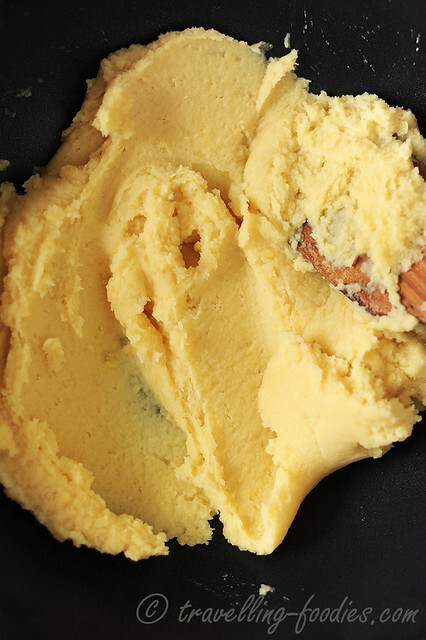 Divide the dough into 30g portions. The easiest way is to weigh out the first few portions and then eyeball the rest for greater ease or speed. Place the portioned dough balls into the mixing bowl, cover with a piece of damp towel and set aside for later use. To assemble the angku kueh, first take a portion of dough ball and flatten to form a disc larger than the balls of mung bean filling. 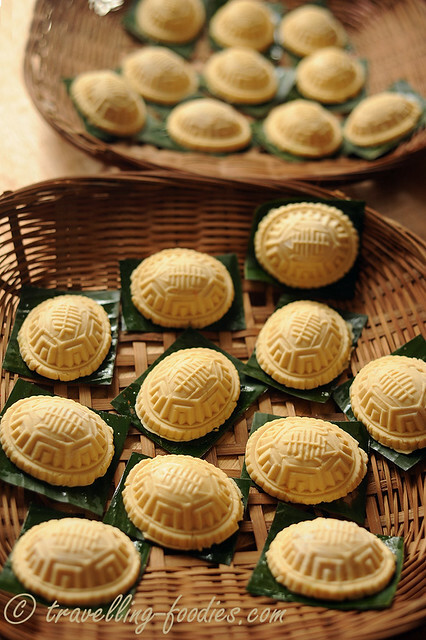 Place a ball of mung bean filling in the middle of the flattened dough skin and process to wrap it carefully. Pinch off any excess dough at the opening and use the pinched off excess to either compensate for other smaller pieces of dough portions or make more angku kuehs at the end. Dust the surface of the wrapped dough ball with a very thin layer of glutinous rice flour *** and place it into the mould with the pinched ends facing upwards. Carefully press the dough ball down slowly and gently to flatten the topside as well as to form a good imprint of the underside. Repeat the process to make more angku kuehs. Place the angku kuehs in a steamer and steam at high heat for 3 minutes. Remove the cover and tilt it over the sink to drain away any condensation collected on the underside before using it to cover the steaming angku kuehs again, only this time a small gap is left between the steamer and cover to allow excess steam to escape. Continue to steam for another 2 to 3 minutes under high heat. 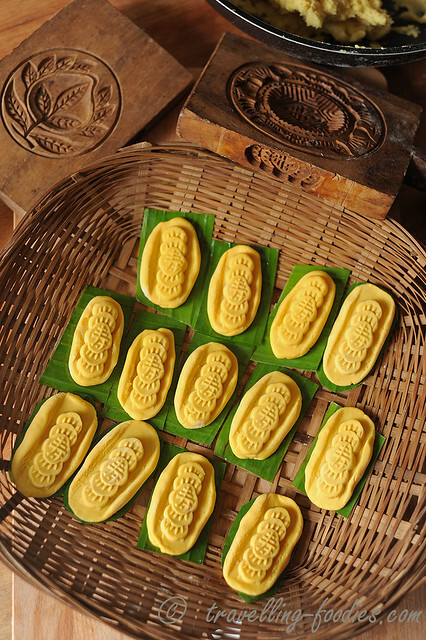 Brush the steamed angku kuehs with a thin layer of oil and set aside to cool down slightly before removing from steamer. ** Note that the portion is for 60g angku kueh moulds, always check the capacity of your moulds as mentioned in the photo descriptions and adjust the size of the dough and filling accordingly. 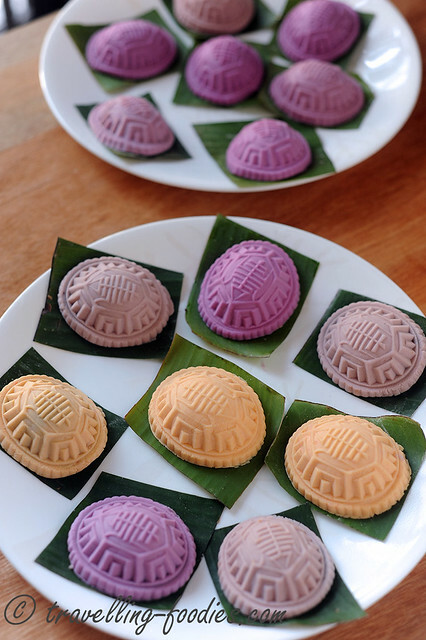 For example, if you are using 45g angku kueh moulds, you can go for 22g of skin and 23 or 23-24g of filling. *** some folks advocate oiling their angku kueh moulds but we never did that. Instead, we dust the surface of the wrapped dough ball with a very thin layer of glutinous rice flour which is more than enough to prevent it from sticking onto the mould. Remember to dust the dough ball and not the mould as performing the latter would only encourage flour to accumulate inside the numerous crevices in the mould which will cause the prints to be lesser defined. ***** it is important to brush the banana leaves with oil to prevent the angku kueh from sticking onto them after steaming. This entry was posted on February 18, 2016 by Alan (travellingfoodies). It was filed under Food, Simple Eats and was tagged with acuan, akk, angku kueh, baba nyonya, chinese, chinese traditional cakes, coconut milk, 紅龜粿, 红龟粿, hokkien, kueh koo, kueh koo merah, Nonya, Peranakan, santan, semayang teekong, straits chinese, sweet potato, 拜天公. Appreciate if you can share how you clean your wooden kueh moulds? What else can I substitude with banana leaves? I noticed that your skin recipe does not call for hot water (liquid), contrary to alot of other recipes I’ve googled, yet it looks so perfect! Please advise if it’s really necessary to use hot water?